From the outside Barry Humphries home in north west London is unassuming. Inside, every inch of wall is lined with gorgeous pre-Raphaelite paintings, book cases heave with first editions. There are thousands of books. I wait for him in a pale blue sitting room with tones of hyacinth. Of course, nothing could be further from the truth. Humphries is the creator of many diverse personas – Dame Edna Everage, Sir Les Patterson and the ghost Sandy Stone. Often they could say things that Humphries himself could not. Humphries is a rare breed – a man who is altogether a man who is available and unavailable at once. He’s intimate, yet detached, kind and razor sharp, cutting. We’re here to talk about his return to the London stage for Rob Brydon probes Barry Humphries Live On Stage. Did he know Brydon already? So, it’s like a bromance? Will he rehearse this probing? No. It’s totally spontaneous,” he grimaces. 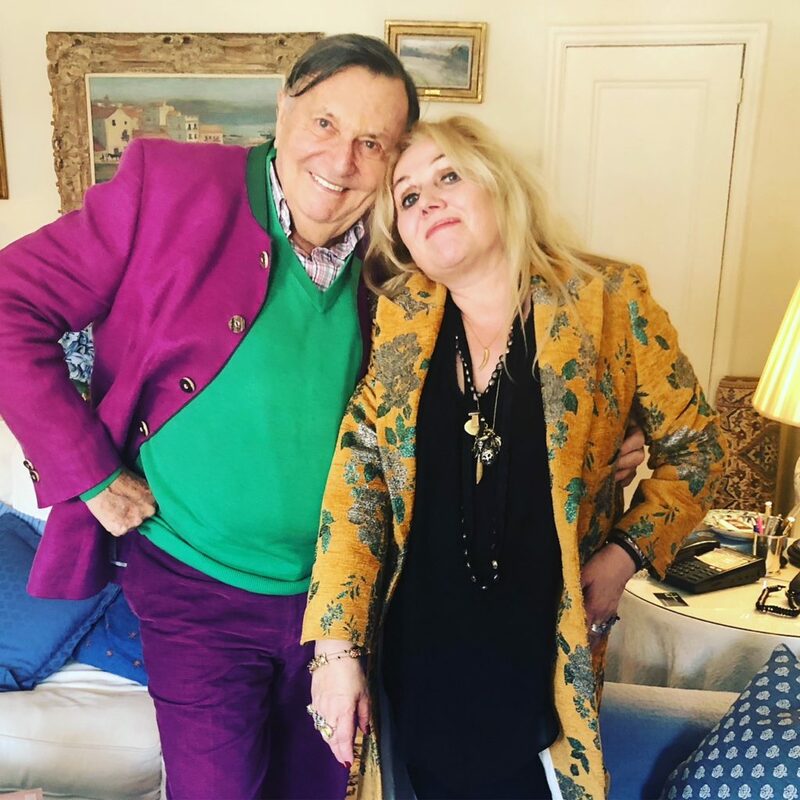 You wonder if it’s hard for Barry Humphries to be Barry Humphries. Last year he put on an intriguing show at the Barbican with the Australian chanteuse Meow Meow. It was a fascinating journey through songs from the Weimar Republic, composers who were banned by Hitler that Humphries had rediscovered as a child. He was whip smart and funny as himself. He’s just back from Australia and is still suffering from jetlag. Where do I live in LA he asks apropos of seemingly nothing, but the eyebrow is raised. Edna did a retirement world tour a couple of years back where she put away her sequinned winged glasses for good. Edna got into trouble before she retired or maybe it was Barry Humphries because people were saying she was very anti-trans. Is it the same political situation in Australia? Edna was still causing trouble even in her retirement. “She was about as gone as Cher or Dame Nelly Melba of whom your younger readers will know nothing (Australian singer who did many retirement concerts). It seems Humphries works tirelessly. He’s revising the comic strip Barry McKenzie, writing the new Edna show and the meantime he has the Palladium. I remember going to an Edna show in Drury Lane and I caught a gladioli. “You catch gladioli like you catch Ebola. Right place right time you get it..” I laugh, he smiles. He hopes his Palladium show will be a conversation about how comedy has changed, about what’s funny and what isn’t. What will be some of his greatest comedy moments? He remembers going to his first comedy show. In the past, Humphries has described Edna as being opinionated, acerbic and bolshy and did he even like her? “I like the effect she has on the audience. She makes them laugh.” Thus, Edna gave Humphries the gift he’d wanted as a child. And it must have been hard for him to give her up to be onstage as himself as he is much shyer. The prep for Edna – the dresses, the wigs, the make-up, the dancing, the eight shows a week must have been very exhausting. And everyone’s always asking where does Humphries end and Edna begin. Suddenly there was no circle. Edna was ended. But it seems he couldn’t live without her and her voice. She’s coming back later this year. There’s already a tour of Australia and US dates planned. He is nostalgic about the comedians and the Australia in his youth. “When they’d done every stage in England several times, when the audience could repeat the words of their comic routines they went to Melbourne to the Tivoli. They made jokes I didn’t understand and I noticed my parents exchanging guilty looks, must have been naughty jokes. Risque. Little did I know I would become a risqué comedian. A blue comic as they were called. Humphries has had a 64 year career onstage. By now he knows the difference. It turns out he has quite a thing for Brydon. As Humphries he’s extremely benevolent. As Edna less so. He cuts an impressive figure today – so colourful and energetic and still has the legs for Edna. Does he feel 85? “No, I feel 52.” He likes to paint. He enjoys a good restaurant – especially one owned by a celebrity chef – and he has friendships with many luminaries including Prince Charles and Camilla. He’s done countless world tours and has written two memoirs – My Life As Me and More Please, both achingly well written. He has courted danger and controversy throughout. I’ve always wondered though is it a political statement. Why is it that Edna never wears a bra? He is the master of being attached and detached all at the same time. It’s been so long since he had a drink, he doesn’t really treat it as an issue anymore. Did he find that Edna had taken away the voice of Barry Humphries so that’s why he found it so hard to return to the stage as himself? And maybe himself was never himself. Humphries was not there when his mother died. He was told she was in hospital but it was nothing serious. But contrary to the end she would say, ‘look at these lovely flowers Barry sent me’ but he had sent no flowers. Also, perhaps the family didn’t tell his mother she was gravely ill. Does he forgive his parents? Rosalind Tong (1957-1970) a dancer, artist Diane Millstead (1979-1989), mother of his two sons Oscar and Rupert and Lizzie Spender (actress and equestrian, daughter of the poet Stephen (1990 till now) He has two daughters, Tessa and Emily from his 3rd wife. Perhaps he should have kept them as girlfriends and not actually married them. “I was doing very well financially and I thought I’ve got to get rid of this money somehow. Is that close to what happened? He once wanted to open a restaurant called The Oubliette, which he would fill with Shostakovich like music so no one would be able to talk at all. “In the middle ages they used to chuck somebody in a hole and then they forget about them so the Oubliette was a restaurant where you are forgotten and the waiter never comes. I remember one time in the 1960’s when a cookery writer at The Express invited me to lunch at The Savoy. I could choose whatever I wanted and she would interview me about food so I ordered Oysters Zarina which are oysters with caviar on them and you dip them in cream. Must have cost a fortune. The chef came to the table and said, ‘you’re the first person to order Oyster Zarina since Ambassador Ribbentrop’. He seems a little sheepish about being 85. There must be a sense of time running out. “Is there a follow up to the CBE and if so, how long does it take?” Humphries is already a dame as Edna. Perhaps people might think a Sir would be superfluous. After the trans-phobia, Humphries got into trouble because he was pro Brexit, anti-Brussels and now he is redefined as anti-Brexit. He’s come back to England because he wanted to see some Australian mates who are not in Australia any more. What does he fear? “Obscurity and ghosts. I’m very scared of ghosts. I believe in them and I’m very wary of them. I don’t like to sleep in haunted places and Australia’s very spooky. Ghosts are there. Explorers and senior citizens. I’ve promised to be one. There is a theatre in Adelaide called Her Majesties. They are building it and I promised to be a ghost there. I still think he just couldn’t let her go.